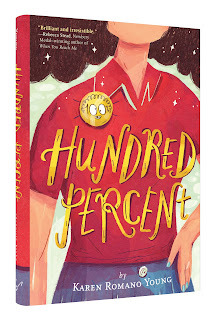 I am thrilled to be part of this blog tour for HUNDRED PERCENT, the latest by Karen Romano Young! The last year of elementary school is big for every kid. Christine Gouda faces change at every turn, starting with her own nickname—Tink—which just doesn’t fit anymore. Readers will relate to this strong female protagonist whose voice rings with profound authenticity and absolute novelty, and her year’s cringingly painful trials in normalcy: uncomfortable Halloween costumes, premature sleepover parties, crushed crushes, and changing friendships. Throughout all this, Tink learns that what you call yourself, and how you do it, has a lot to do with who you are. In late August, Tink got a new name. Her best friend, Jackie, renamed her. This was after Tink realized that none of her school clothes ﬁt and her mother took her on a hellish shopping trip involving two sizes up, three bras-for-the-very-ﬁrst-time, and four arguments about style that had both Mom and Tink in tears. On the way home, Tink convinced her mother to drop her at Jackie’s with all six shopping bags, so they could have a fashion show. HUNDRED PERCENT is a tremendous portrayal of shifting friendships, and really captures all the confusion of 6th grade. I loved the characters' voices--and I think this is one of the truest renditions of the changing relationship between boys and girls at this age that I've read. I loved it! 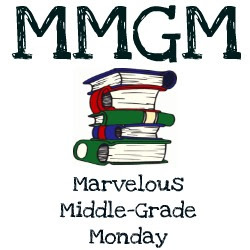 Who are your favorite (middle grade) writers? • Christopher Paul Curtis (Bud, Not Buddy) This book is in my dreams and notes or allusions to it pop up in my own writing often. * Jean Craighead George (fiction and nonfiction) This woman followed her own star to the north, and nerded out exactly as much as she wanted to. • Louise Fitzhugh (Harriet the Spy) Because Harriet, unapologetically curious and observant and obsessed by writing. That Fitzhugh, what an enabler! • Eleanor Estes (The Witch Family, Pinky Pye, The Moffats, Rufus M.) Her writing is so natural, enchanting, it feels like home. • Nora Raleigh Baskin (Nine, Ten) Always taking chances and doing amazing things with not very many words. • Hilary McKay (Saffy’s Angel, Forever Rose) The Casson Family series are my go-to’s when I’m sad, or lonely, or want to do art or write or just about anything. I love these books so much, and when I learned my editor, Chronicle’s Taylor Norman, loved them too, I knew I was in the right place. • David Macaulay (The Way Things Work) Macaulay is proof to me that you can be yourself and do it well and come up with great books that change people’s lives. • Brian Selznick (Hugo Cabret, Wonderstruck) I just can’t even talk to Brian Selznick, I am so in awe of him. I see him at conferences and circle him but never approach. • Grace Lin (Where the Mountain Meets the Moon) Here is someone whose work started out great and just gets better and better. Lin is so talented! • Arthur Ransome’s Swallows and Amazons books — They are a little dated in some ways but really are incredibly respectful toward children. These books emphasize something I can’t get enough of these days: the idea that kids are able, responsible, and capable of independence. • The Girl Who Played with Fire — It’s not often I get drawn in by a thriller, but this series seems to break so many molds that I’m fascinated, waiting to see what will happen next. • Julia Cameron’s The Artist’s Way. I started working through this amazing book/program in September 2015 and have found it to be transformative. It’s not easy being a writer sometimes — and this book helps. • Eleanor Estes’s Pinky Pye. Because it’s summer and the family’s at Fire Island and Uncle Bennie (age 4) is catching crickets every day and wondering why they are missing every morning. What’s getting them? Don’t you want to know? Pinky the kitten is on the case… Also, I find Edward Ardizzone’s illustrations to be sublime (he illustrated The Witch Family, too). 3) Pick a favorite scene from your novel, and say why you like it. 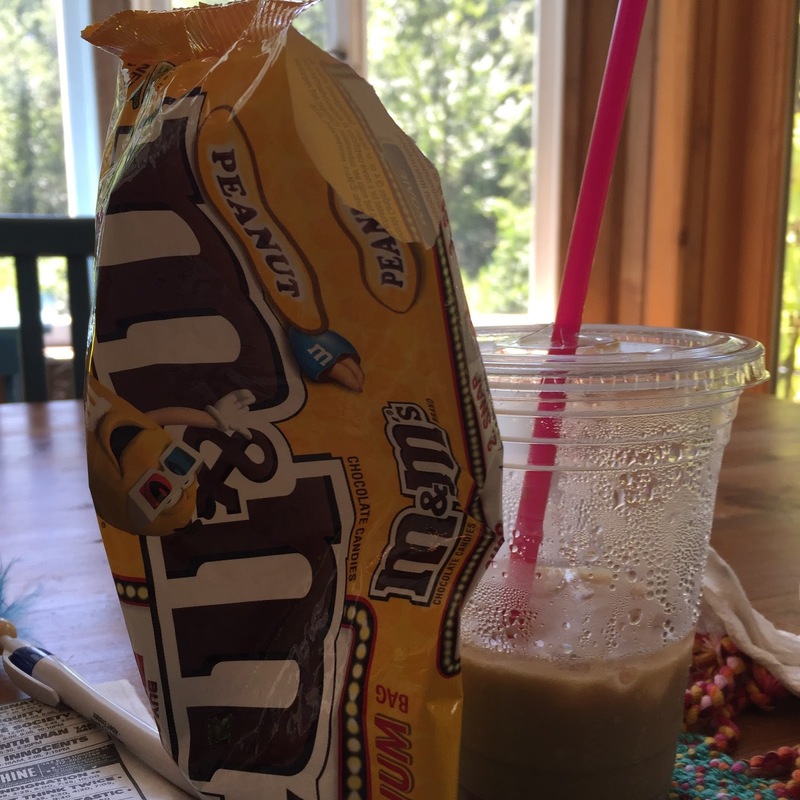 This is funny because just last week I described my lunch of champions as peanut M & Ms and iced coffee. Breakfast is often yogurt, peaches, and/or cinnamon babka. I have a copy of this marvelous book I would like to send to one lucky commenter. Leave a comment, with your email address within, for a chance to win. (US and Canada only, please.) Ciao! UPDATE on 9/18: The winner, chosen by Random.org, is Andrea Mack. Andrea, I'll be getting in touch with you soon! Fun interview. I really like Christopher Paul Curtis too. Tink sounds like a great character. I'll pass on the giveaway. I think books where friendships shift and change are so helpful for kid readers in negotiating their own lives. Sounds like a good one! Fun interview and Karen has a wide range of books on her shelf to read. This new one she has written should be a big hit with girls this age. It can be such a huge time of confusion in their lives. Thanks for featuring this one. Thanks for the great interview, and I'd love a copy of Karen's book. I have several sixth grade girls who would love to read this! What a fun interview! 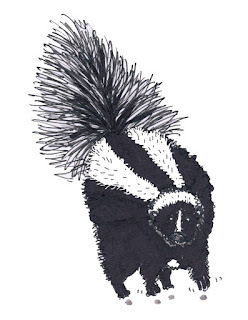 I would so love a copy of this - and that skunk drawing is awesome :) I also want to check out the books on Karen's shelf I haven't read yet! What a delightful interview! Thank you. I'm always up for a book with a strong female protagonist, but please give this to someone else. I've won tons of books lately. Thank you for such an insightful and enjoyable interview. I agree that there aren't many books out there for fifth-sixth graders at a time when their bodies are changing. Important realistic fiction. This should be a hit with girls. Great interview! She mentioned a lot of my favorite authors--Jean Craighead George is amazing. This sounds like a great book for preteen girls. One I would've loved at that age. Please count me out of the drawing though since I'm still catching up with the other books I've won lately. I'm going to read this soon, thanks to this post! Since I have a copy, please don't enter me in the giveaway. This looks like a lot of fun. Thanks for the interesting interview and the chance to win.